Attention must be paid a ballplayer with any record approaching one of Ruth’s. I (Evander) am listening to the Yankees broadcast as this unseasonably, downnright cold (at Right Off the Bat HQ) Memorial Day weekend gets off the ground: the unofficial beginning of summer and all the great baseball stuff that goes along with the “boys” of the season that Roger Kahn wrote about. The amazing Matt Moore of the Tampa Bay Rays is pitching. 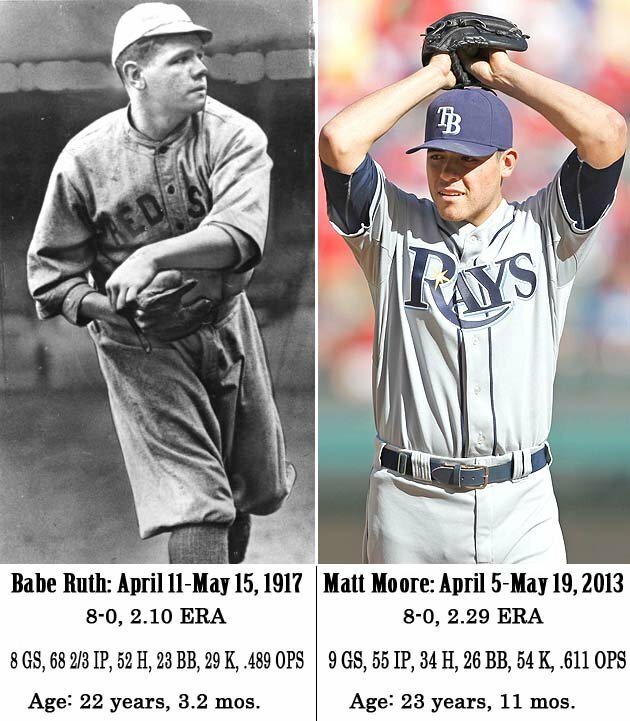 He has pitched with a youthful level of success unmatched by any lefty hurler since (Who else?) Babe Ruth. Moore’s record is not the only astonishing thing about him. Imagine: He was not selected by any club till the eighth round of the major-league draft. What were the other twenty-nine teams doing? Napping? In fact, what was Tampa Bay—a franchise probably selecting early in the first round in that year—thinking thro rounds one to seven? This entry was posted in Baseball, Right Off the Bat Book and tagged Babe Ruth, French cricket, Matt Moore, Roger Kahn, Tamp Bay Rays. Bookmark the permalink.